After many months of debate and review of a slew of opioid bills attempting to address the nation’s current opioid epidemic, last week Congress passed a comprehensive, bipartisan opioids package entitled H.R. 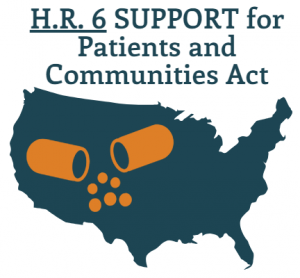 6, SUPPORT for Patients and Communities Act. This bill has now been sent to the President’s desk, where it will most likely be signed later this week. Permanent Medication-Assisted Treatment (MAT) prescribing regulations allowing Nurse Practitioners and Physician Assistants to prescribe buprenorphine as well as increased flexibility for patient caps, and allowing additional advanced practice nurses to prescribe for a period of 5 years. These changes can’t come soon enough – in 2016, over 2 million people in the United States had an opioid use disorder, and over 42,000 deaths were attributed to opioid overdose. Community Health Centers have risen to the challenge in the face of the epidemic. Hopefully, the new policy changes included in this latest legislation will better support health centers as they continue to combat the opioid epidemic at the local level, providing substance use disorder services to all who need it, including low-income patients and rural communities. For more information on specific provisions of the legislation, please refer to this comprehensive summary of the bill. For any questions, comments, or concerns, please contact us at federalaffairs@nachc.org.